Much to the anticipation of progressive rock fans worldwide, for the first time, a rare recording of UK prog group Flash, featuring legendary guitarist Peter Banks, from January 21, 1973 will be released on CD on October 29, 2013. 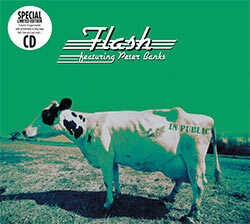 Titled 'Flash – In Public', this historic and exciting concert recording features the original Flash line-up – Peter Banks, Colin Carter, Ray Bennett and Mike Hough in rare form live at Kansas City's Cowtown Ballroom. The show was taped on the very first mobile truck for The Record Plant. Flash were on the same bill that evening with The Byrds, who would disband after a few more dates. The shows were all recorded for the Lee Jeans & Cotton concert series – the first nationally syndicated rock concert series! Peter Banks (15 July 1947 – 7 March 2013) was the original guitarist of British progressive rock band Yes. The BBC's Danny Baker and Big George often called Banks "The Architect of Progressive Music". After Yes, Peter was active with the bands Flash and Empire as well as solo work and collaborated with musicians such as Phil Collins, John Wetton, Tony Kaye, Billy Sherwood and Jan Akkerman. Click here for the Peter Banks Memorial page. Click here to proceed to the archives.